Don't Give Money To Panhandlers? 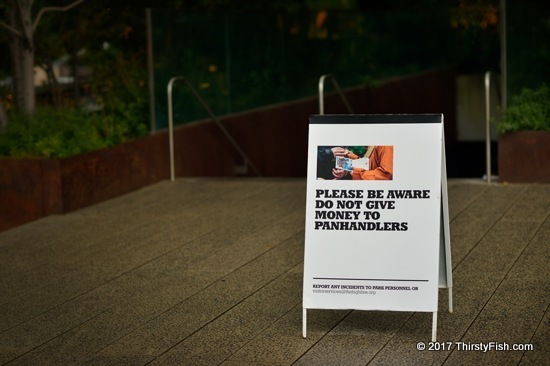 The fact that they posted this sign in such an imposing fashion is somewhat annoying; "Don't give money to panhandlers, because they hurt the image of our prestigious park". One of the favorite mottos of many libertarians is "There is no such thing as a free lunch". They love repeating this ad nauseam. But is it really true? Some of us are born rich, raised with many opportunities and live in the right place at the right time - we do get a "free lunch", and then another one, and another one... Others are not so fortunate, despite their persistent efforts. A third group might be the problem; They are the ones who want something for nothing - the "panhandlers", the "professional beggars". Sadly, most panhandlers are the corporations, universities or non-profits begging for "donations", "grants", "subsidies" and "bailouts". The non-profit organization that operates and maintains this very park relies on "donations". What is the real difference between fundraising and panhandling? Many words have synonyms with a positive connotation when one party performs the act, and a pejorative connotation when another party performs the same act. It gets worse. If your charitable donation ends up in the "wrong hands", you the charitable giver can get in serious trouble. I'm not talking about supporting terrorism here. Cities across the U.S. are criminalizing the feeding of the homeless and people are being arrested for it.